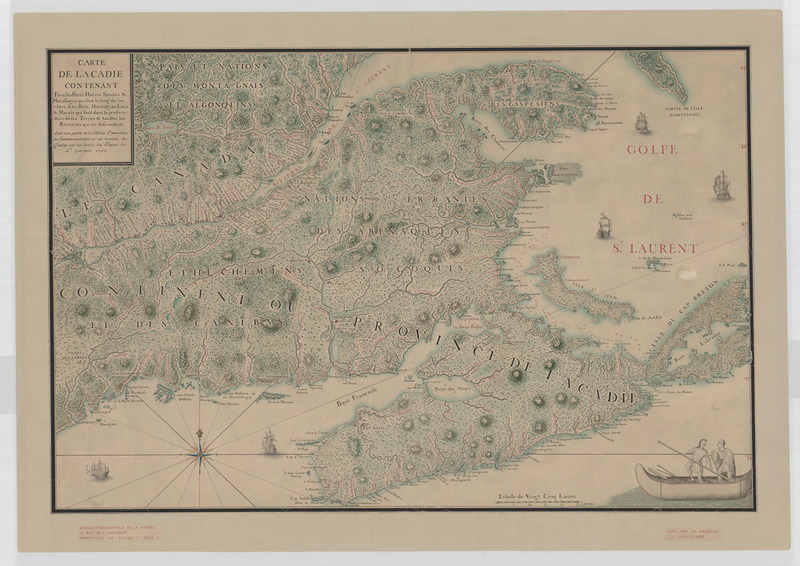 It is the first map of New France to depict the lines of latitude and longitude pretty accurately. It became an evolving map as it was updated up until 1790, despite the fact that Delisle died in 1726. Delisle drew it without ever setting foot on the North American continent. Bay of Fundy and Harbour of Annapolis Royal (as observed by Nathaniel Blackmore in 1711-1712) by Herman Moll (1732). [Source] Please click on the image for a bigger/better resolution. 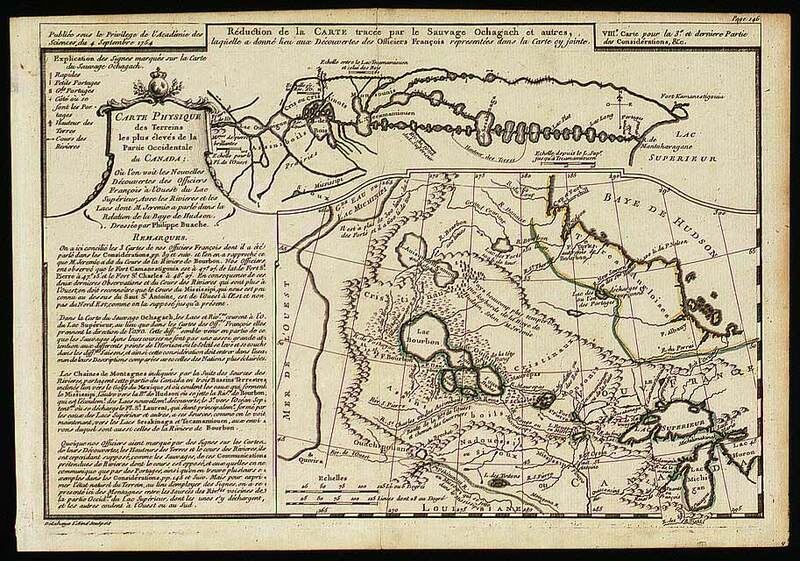 Carte De L’Acadie Contenant by Jean-Baptiste-Louis Franquelin (1702). [Source] Please click on the image for a better resolution. 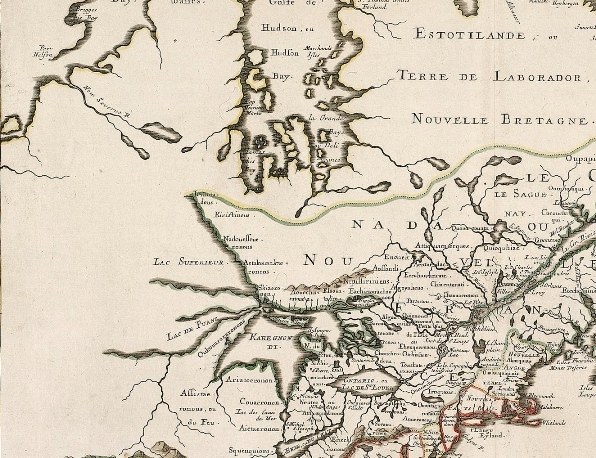 La Canada ou Partie de la Nouvelle France, contenant la Terre de Labrador la Nouvelle France, les Isles de Terre neuve, de Nostre Dame by Pierre Mortier (c. 1700). 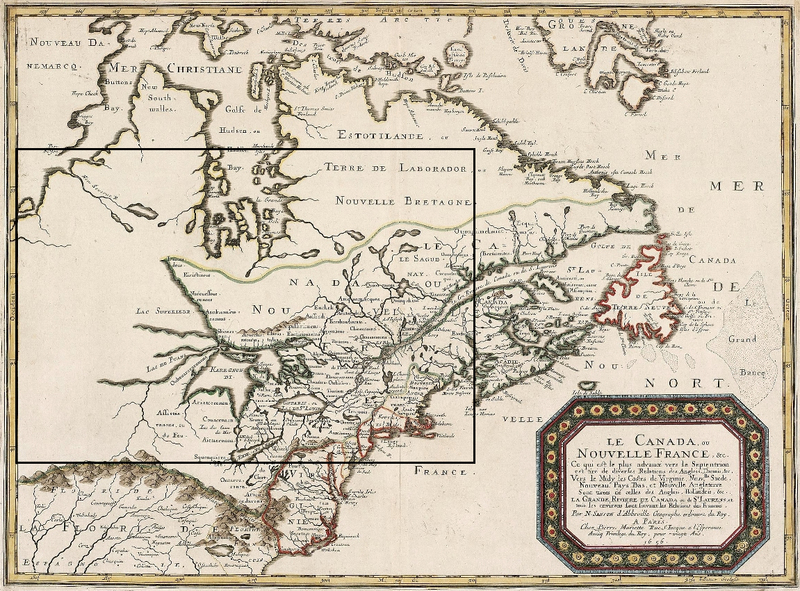 Partie Occidentale du Canada ou de la Nouvelle France… (Western Part of Canada or New France) by Vincenzo Coronelli (1688). Vincenzo Coronelli (1650-1718) was a talented Franciscan monk, cartographer, and cosmographer, renowned for his atlases and globes. 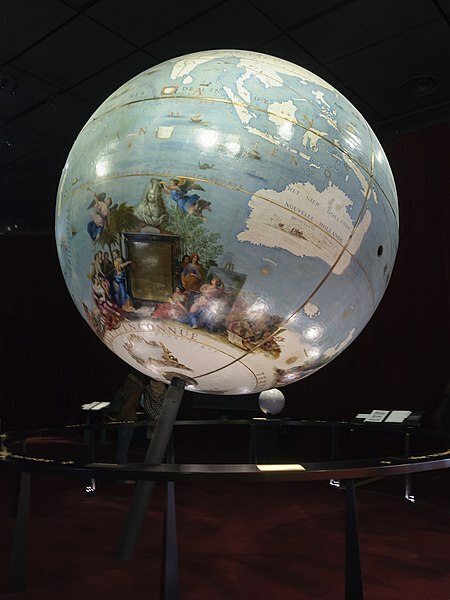 He was commissioned by Louis XIV to create a pair of globes and afterwards Coronelli soon found his craft in high demand across northern and central European courts. 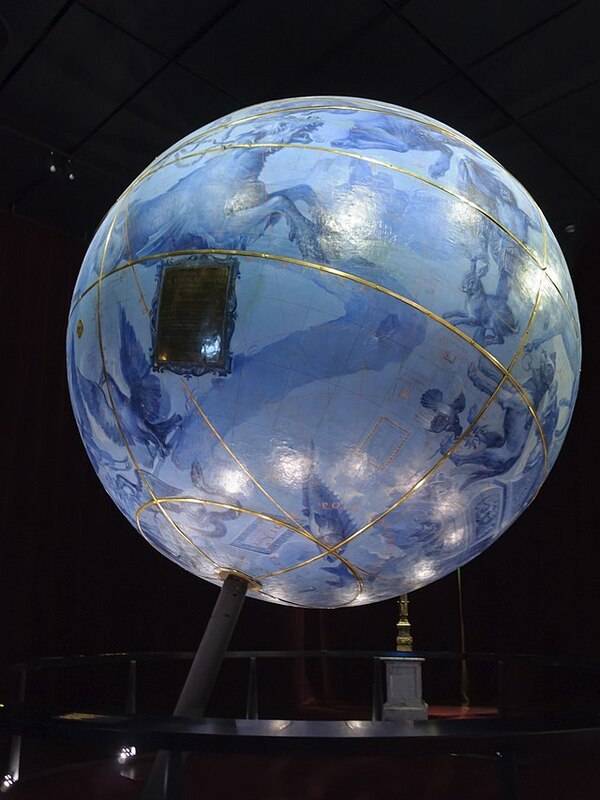 The terrestrial globe (left) and the celestial globe (right) that Coronelli made for Louis XIV. If you look at the bottom right corner, you can see that the map has a super long subtitle. The part that stands out is: “…ou sont les Nations de Ilinois de Tracy, les Iroquois, et plusieurs autres Peuples.” To me, this is really a map about people. Might be hard to imagine, but at one point Ontario and Eastern Manitoba were considered to be “Western Canada.” The fancy blurb at the bottom talks about how aside from this region being called “Western Canada” or “New France,” this area is also referred to as “the nations of the Illinois, Iroquois, and many other peoples.” All along the Great Lakes, you can see the names of various Indigenous nations. I did a rough count and there are about 50 different ones mentioned. Some of the names are familiar, but most aren’t. Sadly, the majority of these nations would be wiped off the map over the course of the next century. 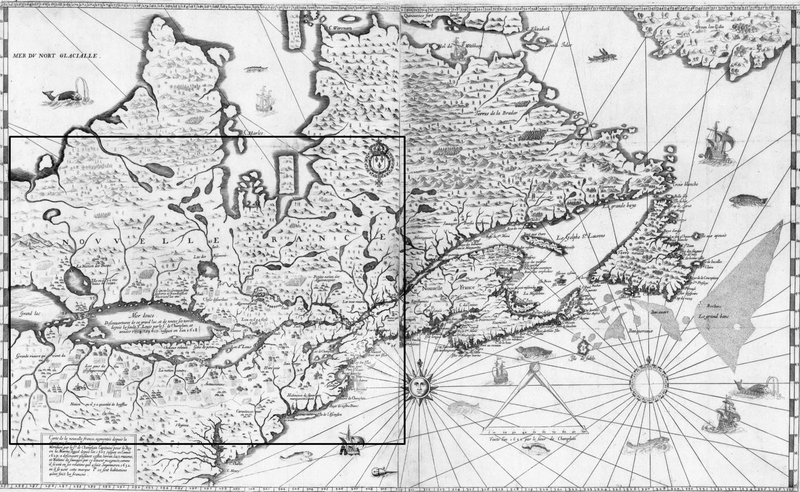 Nicolas Sanson’s Le Canada ou Nouvelle France (1656). Click here for an easier to view, redrawn map. Before Nicolas Sanson became the “Father of French Geography,” he was a history student who grew up in Abbeville, France. Despite his fascination with ancient history, it is said that Sanson turned to cartography “only as a means of illustrating his historical work.” Regardless, Sanson was skilled as a cartographer and his 1627 map of Gaul caught the attention of Cardinal Richelieu. He began to tutor Louis XIII in geography and was later appointed Geographe Ordinaire du Roi by the French King. (Sanson would later tutor Louis XIV as well). Karegnondi was a Huron word for “big lake.” When translated from french, Puans means bad odor or stink. I saw a website refer to it as the Lake of Stinking Water. What a name! However, others argue the name Puans came from a mistranslation during a conversation between the French and the Algonquins who lived in the area. Lake Michigan went through a number of name changes before it got its final one. My favorite though is Lac Du Chat. Lake Cat? What?! Apparently the “Erielhonan” or “Long-Tails” Nation used to reside by the lake. They themselves were named after the mountain lions who used to live in the region. Samuel de Champlain’s Carte de la Nouvelle France (1632). In what would be his last map, Samuel de Champlain sought to bring together his personal observations, accounts from Aboriginals, and pieces of information provided by other European explorers and cartographers into one map. 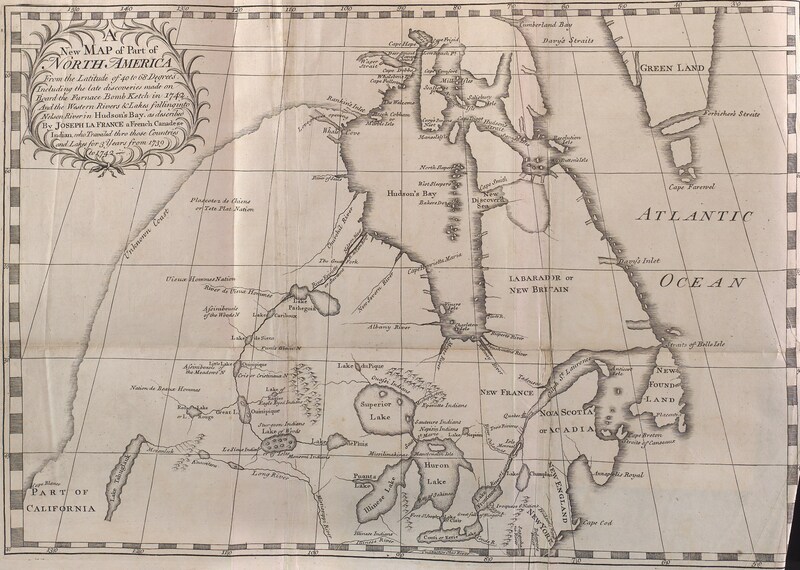 In doing so, Champlain summarized his life’s work and created the most comprehensive cartographic representation of the Great Lakes area in his day. This map depicts North America from Virginia to Newfoundland to northwestern Ontario. Given that Champlain retired from exploring in 1616, the personal observations he drew from came from his Ottawa River and Lake Huron expeditions in 1613 and 1615, respectively. Champlain was 58 years old by the time it was made available to the public through his book Les Voyages de la Nouvelle France occidentale, dicte Canada. At the time, New France was under the control of the English Kirke Brothers. Champlain, having been kicked out of Quebec three years prior, had been going back and forth between residing in France and working in London to get Quebec back. He got his wish in 1632 when the Treaty of Saint-Germain-en-Laye restored New France to the French. Unlike the previous map of his that I took a look at, this one itself contains no groundbreaking/new information. As you can see, there are two glaring errors: his representation of Ontario and the Great Lakes. Given that Europeans had yet to properly explore northern Ontario, the future province is missing its top half. 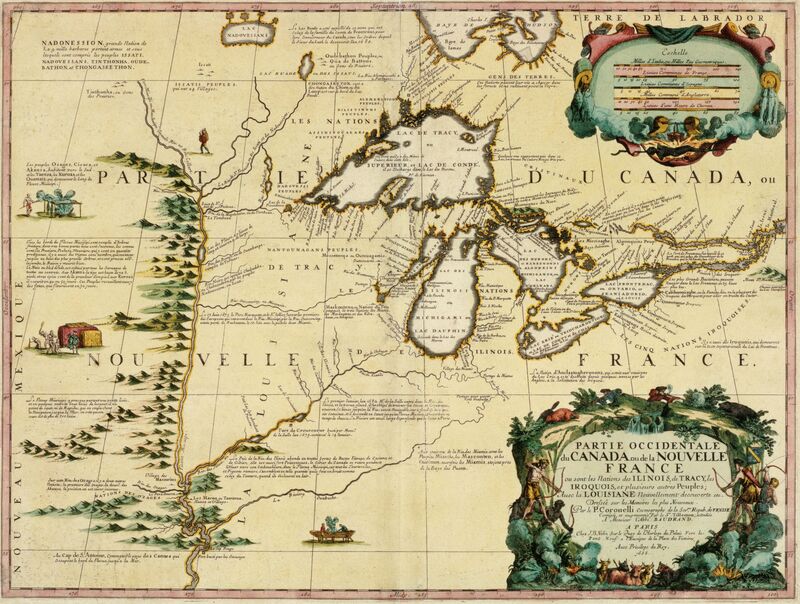 With the Great Lakes, Champlain combined the different accounts provided by Aboriginals and Etienne Brûlé in regards to Lakes Michigan and Superior to create the ‘Grand Lac’. 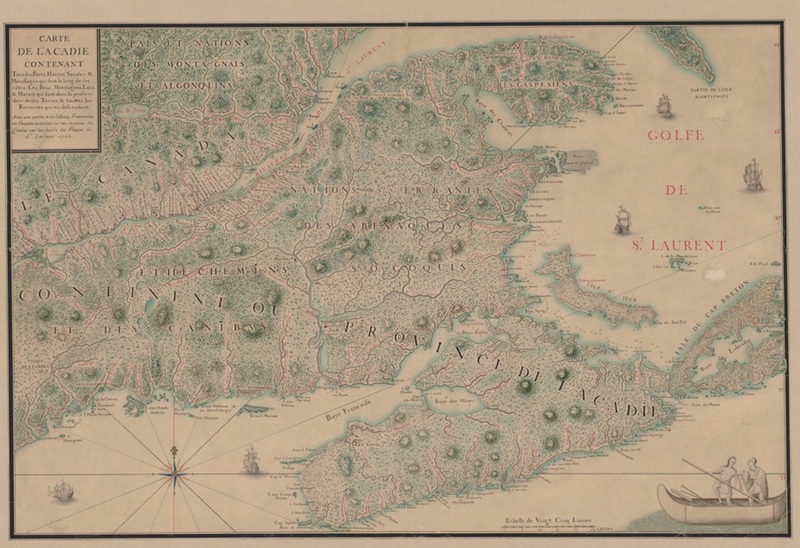 In despite of this, Champlain’s last map was still a milestone in Canada’s cartographic history. Champlain’s revisions, (largely thanks to the accounts of the ill-fated Brûlé), made this map invaluable to future explorers and mapmakers. He died in Quebec on December 25, 1635 at the age of 61. 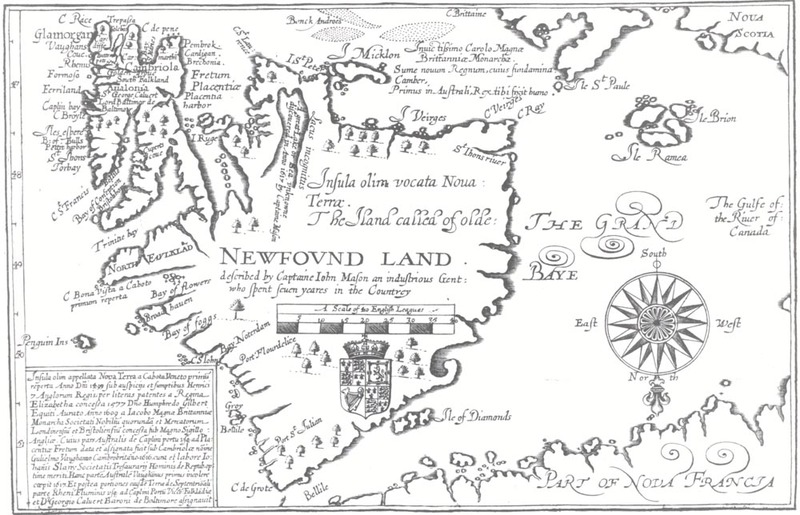 Newfound Land (1625), described by Captain John Mason. Published in William Vaughan’s Cambrensium Caroleia. Captain John Mason was a busy man—or as the map says, an “Industrious Gent.” Before he founded New Hampshire in 1629, had a career in the British Navy and found himself in jail twice. Once by the Scots for being part of King James I’s attempt to reclaim the Hebrides. (an island off the west coast of Scotland), the other for piracy. Despite this, he succeeded John Guy as the appointed Governor of Cuper’s Cove (now Cupid’s Cove) in 1615. An explorer at heart, he traveled around the area during his tenure and helped to draw up the first map of Newfoundland. Mason would later grow tired of managing the fighting between the settlers and the fishermen over their respective rights and cut his ties with Newfoundland in 1621. * Actually, no. Diamond mining in Canada did not really exist until the 1990s and it is based up in the Northwest Territories.